The lyrics sound like they were hurriedly scrawled on the back of a three-ring notebook on the way to the recording sessions. But the biggest issue with this album is the lack of catchy melodies. 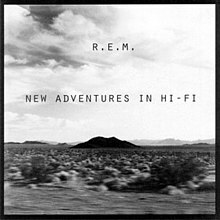 The guitar work is as pretty as most REM albums, but the rest of the production is very dark and hard to get excited about. Even the songs that do have decent melodies or lyrics get sabotaged in production – “Leave” for instance, which would be a better-than-average REM song if it weren’t for that annoying siren running through the background of the whole thing. It does get a bit more tolerable in the middle of the album, as both “Bittersweet Me” and “Be Mine” are good efforts. I’d be curious if anyone regularly listens to this album today, and if so, why.